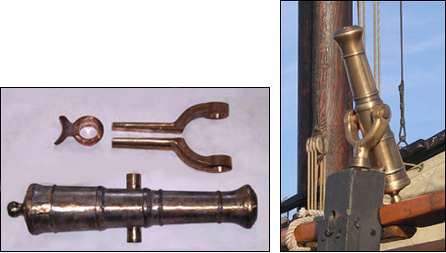 Cast using naval gun bronze from an original mid-18th century pattern with the trunions mounted low on the tube, our gun is priced thousands less than the cost of a finished bronze barrel sold elsewhere with the same casting quality. The barrel comes rough cast and bored but without the touch hole drilled and can easily be finished in 2 to 3 hours using a die grinder with Scotch-Brite pads, metal files, a wire wheel and some emery cloth. 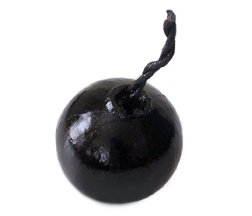 The total length from muzzle to cascabal is 23", the barrel weight is 55 lbs and the swivel yoke weight is 10 lbs. 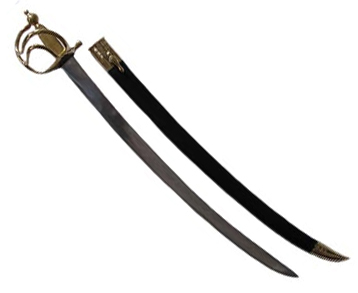 The unlined barrel has a concave breech with a breech wall that is 1.3" thick and a bore size of 1-3/4". Proudly made in the USA.